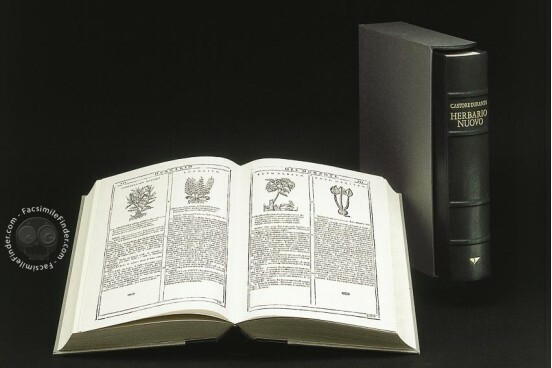 The Herbario Nuovo or New Herbal by Castore Durante attracts enthusiasts and specialists alike for its botanical and medical-pharmacological content, as well as for its intrinsic historic-literary importance. This book was first published in 1585 and from that time until 1718 it was reprinted eight times. The distinguishing feature of the 1717 edition is that it was not listed in the botanical bibliographies of the time, perhaps because only a few copies were printed, and is therefore a rarity in Italian and European libraries. The 1717 edition includes all the corrections and addenda made in the previous editions, an up-dating procedure that resulted from the inclusion of descriptions of exotic species that were used as pharmacological and nutritional products only after 1585. With this work, which he titled Herbario Nuovo, Durante set out above all to disseminate knowledge of medical subjects that had been handed down from ancient times to the 16th century and that were based on the use of simples – those elements, mostly plants, from which the active ingredients used in the remedies of the time were extracted. In fact, herbals were basic texts for both physicians and herbalists; the plantstherefore had to be easily identifiable and, above all, the descriptions of their practical application as remedies – which were often misunderstood or were the object of fantastic speculation or even guesswork – had to be extremely clear. This work contains more than 900 species presented in alphabetical order according to their common name, which is followed by their scientific names in Greek and Latin, as well as some of their common names in Arabic, French, Spanish and German. Although they adhere to 16th-century criteria, the morphological descriptions tend to provide all the information needed to identify the species. But it is the illustrations that accompany and complete each individual entry which fascinate readers, as they are both essential and thorough: this is a book whose llustrations were chosen by the author not as mere "decoration", but above all as active – and still valid – complements to the description of the various species. And the fact that they are woodcuts lends the patina of age to the volume. The Herbario Nuovo is organized much like a handbook: it is easy to find the individual entries and the information regarding the properties and uses of each plant and the descriptions are written fluently. The author of the Herbario Nuovo, which was first published in Rome in 1585, is Castore Durante, a physician and "citizen of Rome" who was born in Gualdo Tadino, in the province of Perugia, in 1529. A subject of the Papal States under Pope Gregory XIII and Pope Sixtus V, Durante was active in the cities of Viterbo, where he died in 1590, and Rome, where he distinguished himself in his profession and became well-known as the author of scientific and literary works. Printed book on paper − 33 × 23 cm − 640 pp. Full-size color reproduction of the entire original document, New Herbarium by Castore Durante: the facsimile attempts to replicate the look-and-feel and physical features of the original document; pages are trimmed according to the original format; the binding might not be consistent with the current document binding. This anastatic reprint of Herbario Nuovo is a high-level publishing initiative undertaken by Priuli & Verlucca Publishers in collaboration with the Regional Museum of Natural Science of Turin (owner of the original herbal).